Thank you very much for your kind comments on the loss of our sweet Carlotta. They are very much appreciated. We both are still devastated and I wouldn’t be able yet to write a blog post about some creations but I had this one prepared already and thought, I would post it. Today I’ll try to create something to get some distraction and I’ll start visiting you and catching up with you soon. 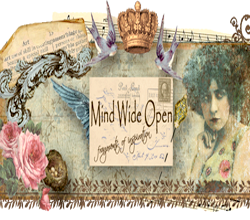 When I saw Gail’s beautiful Paris themed image for this month’s Mind Wide Open contest, I was in. Some days before I had bought a cardboard jewelry box with little drawers and the plan to alter that pink thing. You know that I love neutral colors and so I changed the challenge picture into neutral tones. Additionally I used the oil painting feature on Paint.net for a more washed-out look. After I had removed the pink paper, I covered the box with book pages of a vintage German-French dictionary and dry brushed them with white paint. I did the same with the inside and outside of the drawers except for the fronts where I adhered Gail’s image. Finally I added some lace and buttons. to see the other wonderful creations and to vote for one if you like. I recently had a wonderful swap with Anneke over at lasize. Anneke sewed this gorgeous corset bag for me. Isn’t it the cutest thing? Ann as well spoiled me with lots of pretty laces, two lavender bags and some charms. Thank you very much, dear Ann! These are my gifts for Anneke. A tussie mussie and a jar filled with some lace and fabric flowers and a box with some buttons and charms. All three images I’ve used were provided by the lovely Graphics Fairy. Thank you, Karen! This morning we found Carlotta, our sweet outdoor cat and the mother of our kittens, dead. I don’t like to go into details. We know that a moment of abstraction had lead to what happened and it didn’t happen on purpose. We are very, very sad. Good-bye, my sweet friend. You’ll be in our heart forever. When I receive a package, I get a little note in the mail, telling that there is something for me to be picked up in the main post office in Tirana. In the little town where we had lived in Germany, driving to the post office took me 1 minute and there was always a parking spot available. Here it’s a totally different story. Besides the lack of parking lots in the city and the heavy traffic, there are these totally, totally crazy drivers. Not only a few like everywhere but an incredible amount. Whatever they learn in driving school, especially the guys seem to forget it the minute they got their license or maybe they just don’t want to follow any rules because that and driving less reckless would take away from their masculinity. Red lights, stop signs, road markings … those things are obviously not made for machos. I’m not a chicken-hearted driver but here I don’t drive. NO WAY! Sitting on the passenger seat often enough freaks me out. That means, dear hubby has to drive me everywhere I need or would like to go. He doesn’t mind doing that but when he’s got lots to do, it can take a few days until we can make the trip to the post office because it needs some time to get in and out of the city. On the postal slip I receive, the country of origin is stated, so I often have a guess who is the sender. When I got a message that a package from England had arrived, I was quite sure that my sweet friend Liz over at Lululiz in Lalaland had sent me something. I would have never expected though that it was the gorgeous white shadow box house she had shown on her blog before. The house would have been an awesome gift already, but Liz had filled each compartment with wonderful treasures and even added some more surprises. To show you the beautiful graphics, Liz had used for the background, I’ve put in only some of the goodies. I LOVE this house. Isn’t it fabulous? Liz has spoiled me with a lot of her wonderful vintage flea market finds, like pre-wound bobbins, a monogram stencil with my initial, laces, millinery flowers, a frozen charlotte and a needle book. She added one of her beautiful tags and these cute envelopes that had contained the stencil above as well as the vintage pearls and the little numbers you can see in the next picture. This is a tiny pot, Liz had found in France. Normally it’s used to serve a snail. I’ve eaten snails once and they tasted good. It was a one-time experience though. Let’s say the night after had been far away from pleasant, lol. A serving of vintage pearls is much more my liking. When I opened the package, an enchanting scent of lavender escaped. It came from this lovely lace, Liz had perfumed. The beautiful box was full to the brim with creamy white buttons. This was an amazing package. Thank you so much, dear Liz! The gorgeous house hangs in my studio and I’m looking forward to playing with the lovely goodies. I’ve received some more great packages lately and will show you them soon. With the following cards I’m much more behind. I wish I could say they came a few weeks ago, but it’s already been some months. This adorable card was created by my dear friend Martina over at Stempel-Gewerkel. My dear Danish friend Dorthe over at Den Lille Lade had sent me this lovely card. From my dear friend Marie over at Lost Bird Studio I had received this beautiful creation. Thank you very much again, sweet friends! All three cards are displayed in my studio. I’m off now to take a bath and then I’ll probably play a little bit with fabrics and laces. Sounds good, doesn’t it?